And here is part of the Foreword: In this volume, you will notice those who have risked observing their living with the delicate venture into what is other. You will wander in the wilderness of the pain caused by misinformed choices. You will see those who turn hallucination into healing. You will enjoy the turning of death from empty religion into the raw gift of grief. You will pay attention to the packages offered in the stories that announce the timely gift of reconciliation and forgiveness; hope from the places of deep pain re-imagined and healed through the telling. Each describes what is beyond the ordinary, as well as what is deeper in the vicissitudes of a faith moving well beyond religion and into the heart songs which religion hopes to honor, but has become limited by its penchant to be above doubt and beyond mystery. – Rev. David Rommereim. Finally, a few of our words from the Preface: Much of the work in this volume is not religious – the doubts that strain one’s faith are questions of character, difficulties in personal relationships, or problems in the family. 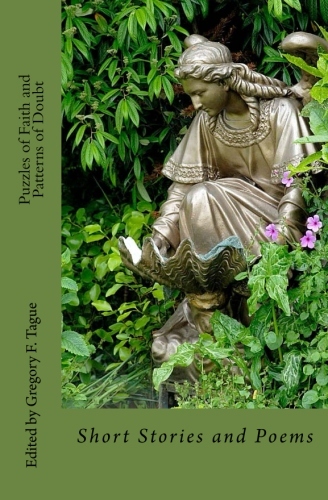 The puzzle of faith is not really about God, it’s about the human predicament: our sins, our mistakes, our failures (and at times our glories) with ourselves and others. We trust you will support the press and pick up a copy of the book – don’t forget that we do offer discounts – and tell all of your friends, family, and colleagues about us and what we are doing. Not all features are yet live on the Amazon page (e.g. *Look Inside* - give that a few days), and it takes a little longer for the title information to appear in other distribution streams (other online sellers and bookstore databases).